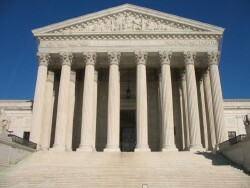 Here’s another nugget for connoisseurs of under-the-radar news: According to the Supreme Court website, the justices placed on the agenda of their Friday, November 14, 2008, conference a discussion of whether to grant certiorari in a case now known, mellifluously, as Reed Elsevier Inc., et al., Petitioners, v. Irvin Muchnick, et al., Respondents. Once upon a time the case was called In re Freelance Literary Works in Electronic Databases Copyright Litigation. But that was before a slate of objectors, led by myself, challenged the terms of a global settlement of publishers’ decades of systematic infringement of the works of freelance writers. The settlement, brokered by three writers’ organizations, was approved in district court in 2005 but thrown out by the Second Circuit Court of Appeals last November. Read all about it on my blog, http://freelancerights.blogspot.com. The appellate court invalidated the settlement not on the basis of the merit arguments raised by the objectors, but due to a technical wrinkle on which, ironically, we disagree with the court and agree with our adversaries. The Second Circuit said a class action copyright settlement could not include the claims of copyright holders whose works were not formally registered with the Copyright Office. (The consensus is that that would cover more than 99 percent of the potential claims.) The defendants and plaintiffs jointly appealed to the Supreme Court; our attorney, Charles Chalmers, then weighed in with a response at the invitation of the justices. High Court watchers say that it often announces “cert” decisions very quickly after conferences, so there’s a chance we could hear as soon as today. But it gets even more interesting: an alert blog reader informs me that the justices – who, by design, move in mysterious ways – also sometimes rule on more than just the petition to hear the appeal. They could decide to jump into the substance of the proposed settlement itself, and make the announcement in a tersely worded order in one fell swoop. Or, of course, not. Either way, I think, what I’ve dubbed the UnSettlement is deader than the W. administration, and for equally good reason. After subtracting fees for plaintiffs’ lawyers who were in over their heads against the publishing industry and now want to quit while they’re behind, hundreds of thousands of freelancers worldwide stand to scramble over $11.8 million in crumbs to cover years of having their articles redistributed on LexisNexis and similar products. Worse, the UnSettlement provides for a “license by default” into perpetuity for all those who didn’t file for their $5-and-up (!) claims, and has no prospective royalty system. This last feature is what I hope most piques the Supreme Court’s interest. In the 2001 Tasini v. New York Times decision, the court ruled for the plaintiff freelance writers across the board in their contention that Section 201(c) of the Copyright Act gives periodical publishers only a one-time license to publish non-staff-written articles. The court explicitly suggested, as a solution, a royalty system similar to that devised by ASCAP in the music industry after the advent of recording equipment and radio. But publishers ignored the justices, damned the torpedoes, put out propaganda to sell the public on the idea that their for-profit applications of infringement were paragons of “access,” and shoved all-right-contracts down the throats of freelancers to make the problem go away in the future. And the Authors Guild, National Writers Union (for which I was assistant director from 1994 to 1997) and American Society of Journalists and Authors caved in – to their everlasting shame. A recent development suggests that this fine mess, like seemingly almost everything else, may eventually have everything to do with Google. The proposed $125 million settlement fund in the Google case may or may not be on target. But unlike the sum in the freelancers’ settlement, it is not, on its face, chicken feed. And the Google settlement does provide for establishing a prospective royalty system, which I advocated for freelancers for years prior to the Supreme Court’s Tasini decision, and which I have promoted ever since as the only just and reasonable resolution of the UnSettlement. The technology exists; it’s just that the power imbalance between publishers and writers have given the former the notion that they can dismiss compromise and flout the law. In addition to blogging about freelance rights, Beyond Chron contributor Irvin Muchnick blogs about his 2007 book Wrestling Babylon and his forthcoming book Chris and Nancy: The True Story of the Benoit Murder-Suicide and Pro Wrestling’s Cocktail of Death, at http://muchnick.net/babylon.